Ahh, what a wonderful sun filled, spring like weekend in late April. 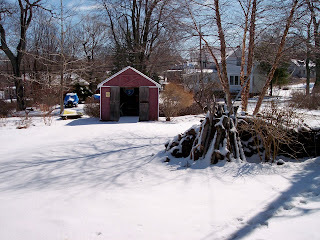 The great Nor'Easter of 2007 has departed, the cleanup has begun, the water is running again, the electricity has been returned and the Sox are playing the Yankees once again. Life is slowly returning to normal. 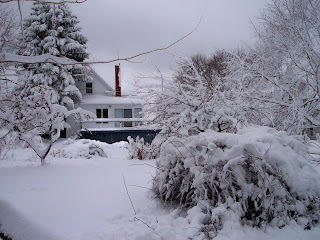 While in Maine, the storm was powerful and damaging, yet once the power had been restored, you missed the quietness that fell over the island, the impromptu neighborhood pot luck meals that broke out wherever there resided a propane stove and the very early retreats to bed to get warm under the extra layers of covers. You don't miss the 47 degree temps in your house, hauling water for the toilet flush, trying to keep a fire going while 50 mph winds are trying to take down your chimney and smiling while eating the same pot of stew for the 4th night. But, storms end, the sun reappears, chainsaws tackle fallen trees, tarps are nailed down on barren roofs where once shingles resided, smiles reappear and the island begins to pull itself together. Like little children, we all danced when the electricity reappeared just in time for the weekend series with the Yankees. Nothing reflects normalcy more than viewing the frothing fans of Fenway as our beloved Townies score 5 runs in the bottom of the 8th Friday night to overtake and beat the damnable Yankees. Nothing reflects normalcy more than viewing once again the frothing fans of Fenway as Beckett bends the bad guys and Super'bon stares them down from beneath his low browed cap and blows em away in the 9th to take game 2. Nothing reflects normalcy more than counting the hours until tonight's game with Mr. K taking the mound trying to take three straight. Yes, it's only April but it's the Yankees. 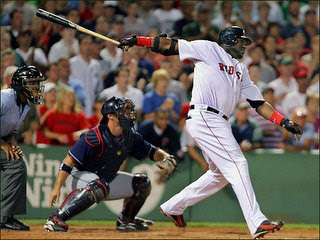 Nothing else matters more than erasing the stain of the last series held at Fenway in '06. Matters not the month, only the results!! Keep those rays of sun coming; we need all we can get and oh ya, A-Rod, enjoy your latest title of "Mr. April"--priceless. Paging Mr. Gore, Paging Mr. Gore!! Enough already; who did we poor New Englanders tick off this time????? It's April 13th; yes, Friday the 13th and once again we got another 6" of everything dumped on us. Here on Peaks it wasn't too bad; mostly snow mixed with whatever else chose to come down on our heads--sleet, hail, rain, ice, generally it deserved just to be called "whatever". At least today, the sun is shining, the "whatever" is melting and it's a beautiful post storm day in Maine. Tomorrow is supposed to be the same but then Sunday and Monday, we're due for a pretty strong Nor'easter. Let's just face it; it's too bloody soon to put the shovels and scrapers away just yet. Snivelers of the world UNITE!!! Ninio, Ninya, Pinta, Santa Maria; whatever "El" is upon us; enough is enough. It's time for some baseball, yard work and most of all it's time for some Golf!!!!!!!!!! Set my people free; we're slowly losing our sense of humor. 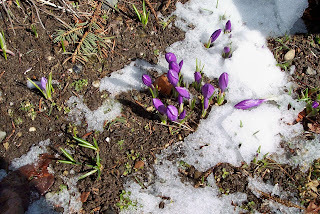 Enjoy the sun for today at least; we'll snivel about tomorrow whenever it rolls around. Let's play some baseball tonight!! 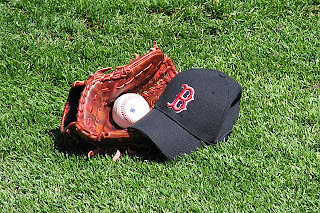 I may well be 64 years old with diminished physical and mental capacities, there may still be snow on the ground outside my window, a stiff northerly breeze may still be blowing but for today, the grass is green, the sun is warm and all is right with the world for it's Opening Day at Fenway!! Nothing can make me feel younger than to be up and about with a fresh pot of coffee, the sports page read, the Globe sports page visited on the Web just waiting for the opening day ceremonies at Fenway at 1pm. Today's highlight for me will be revisiting the remaining members of the 1967 Impossible Dream team as they walk into center field at the old ball yard; my youth on parade. Hell, the first 15 years of my following the Sox were spent trying to escape the basement of the American League. In the Spring of 1961 I remember taking four visitation days out of high school to check out the possible college sites of BU, BC, Northeastern and yes, even Harvard with a couple of friends. We did manage to see each and every campus from the car as we headed directly for the center field bleachers at Fenway; walked up, bought our tickets and found a seat! From last to first in 1967 changed all that forever as Red Sox Nation was born. So many memories, so many pains, so many possibilities each and every Spring and Summer. Life is being born again, again and again. Let the new season commence at Fenway and may we all spend way too many hours living and dying and complaining with this year's version of the old Town Team. Go Sox!! 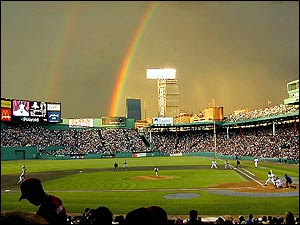 Though the last picture is from the Sox/Yankee classic comeback of 2004, I can always look at it one more time; WOW!! The Red Sox AA affiliate, the Portland Sea Dogs, have their Opening Day game set for 4pm today at Hadlock Field in Portland. 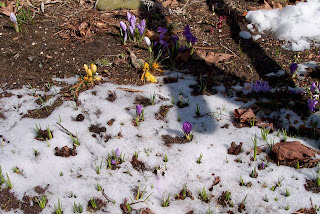 OOOOPS, not so fast said ol' Mother Nature. Nothing like 6-10" of fresh, wet, heavy snow last night to put a bit of a damper on man's best and well intentioned plans. Looks like we'll have to settle on watching the Sox play in Kansas City this afternoon followed by the opening round of the Masters Golf Tournament followed by the UMaine hockey team's Final Four game. So many things, so little time!! 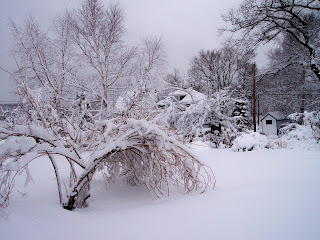 While beautiful, it was a really heavy, wet snow so many limbs came down taking some power lines along with it. On our part of Peaks, we lost power for about eight hours. The worst part of it meant my first coffee of the morning was not exactly steaming. Lisa from the coffee shop had nothing to do so she drove the newspapers around and helped deliver them with her mother honkin' huge V-8, high bodied mega truck. Maybe, we can't have coffee but we got our newspaper!! Around 10:30 am, the power returned after a couple of fits and starts so the mad dash was on to get a hot pot of coffee and a hot breakfast made. After that was done, anything else the day could throw at us was insignificant; we were good to go!! 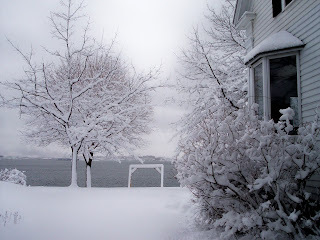 Enjoy the pictures of an early Easter winter wonderland. The last one is for luck. I stole it from the daughter of my cousin who is a complete Sox fanatic. She's just returned to her home in Atlanta from Opening Day in Kansas City; now, that's a true Red Sox Nation devotee. 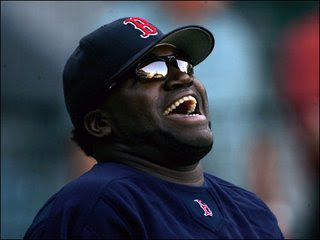 In 48 hours, we'll be down to mud and deep into the Masters and the Sox; Spring is definitely good!!!!!!!!!!!!!!!!!!!! Go Sox, Go Seadogs!!! !